Swim in Krka National Park Croatia — Sapphire & Elm Travel Co.
Krka National Park in Croatia, the less famous and less crowded cousin of Plitvice Lakes National Park offers something Plitvice doesn't; the pleasure of swimming in it's magnificent waters. Chances are you've heard about or seen pictures of Plitvice Lakes National Park, Croatia. If not, you are probably living under a rock. Plitvice Lakes is the now ultra famous national park in Croatia with a series of 16 terraced lakes and seemingly never ending waterfalls; all available for your viewing pleasure via charming wooden plank walkways. Images of Plitvice Lakes from a birds-eye view (like the one below) fill the internet, inspiring wanderlust in even the most novice travelers. Yup, knew you'd recognize this image of Plitvice Lakes. But this article is not about Plitvice, Croatia's most famous national park. No, it's about it's lesser-know, off-the-beaten-path cousin; Krka National Park. The park I didn't know about on my first trip to Croatia in 2012, and therefore missed. The park that you can SWIM in. I mean... come on, Croatia, could you be any more charming and lush?! I absolutely fell in love with Croatia the first time I visited the country in 2012. So during my "European Summer" five years later, I was without a doubt going to go back to Croatia. Croatia has it all; warm sun, beautiful beaches, centuries of European history, delicious food and wine, and endless cultural cities, charming towns, beautiful islands, and waterfalls to explore. But mostly, the deep desire I had to go back to Croatia was to a few places I heard so much about since my first trip to the country; Dubrovnik, Hvar and Krka. I went to Plitvice Lakes in the summer of 2012, the first time I was in Croatia. Back then, Plitvice Lakes wasn't a tourist destination. I created a trip that would take me to Santorini and Mykonos in Greece, Rome and Split, Croatia. It wasn't until we were in Split that we has heard of this experience and we thought, yes, definitely! Walking through Plitvice Lakes was a lovely experience including a delicious traditional lunch and a couple boat rides. Just a few weeks after I went to Croatia, I heard about Krka National Park; Plitvice's smaller, less crowded and less popular cousin! Isn't that how it usually works?! Krka National Park is smaller, yes. However, the major difference between the two is that you can swim in Krka National Park where you cannot at Plitvice. The image of swimming in these massive natural pools with waterfalls 40 feet (12 meters) tall, gloriously haunted my dreams giving me motivation to come back to Croatia. Needless to say that I was very much looking forward to exploring and swimming in this park! 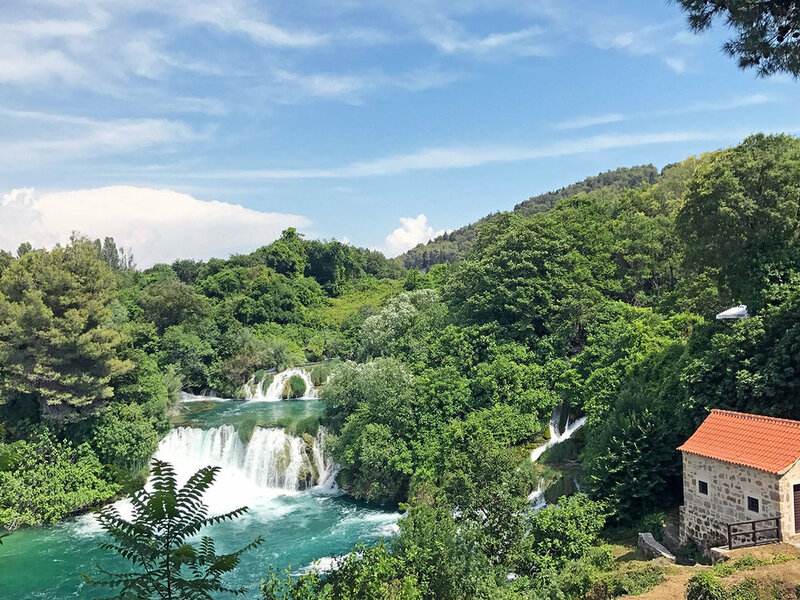 Krka National Park is a 109 square km forest reserve with 7 terraced lakes and waterfalls, offering many wonderful areas to swim in, paths to walk, and places to stop and enjoy the view. You can take day trips from Split and Zadar, the two closest major cities. I chose to take the bus on my own so that I wasn't going to show up at the same time as hundreds of people on several tour groups. Krka National Park is open for visitors year round, and can be toured by water, by road or by foot on our many hiking trails. There are five official entrances to Krka National Park: Lozovac, Skradin, Roški slap, Burnum and Kistanje. Click here for pricing. I took the bus to Skradin, and at the entrance bought a ticket to the park which included a boat ride to the beginning of the park. There are various footpaths in Krka National Park for you to explore, plus a museum, restaurants, a monastery, an island called Visovac, grass to lounge, read or picnic on and more. TRAVELER'S TIP: Make sure to look at bus schedules ahead of time as even in peak of summer the busses were limited, and because the boats from the entrance towns to the lakes are on a limited schedule as well you might be pressed for time at the park. Want to swim in Krka National Park, explore Plitvice, walk the walls of "King's Landing" aka Dubrovnik, island hop, wine taste and enjoy incredible beaches? Then you should consider a vacation to Croatia. Contact us starting planning your one of a kind adventure to Croatia and beyond.